A few days ago, we published our newly updated Universal Studios Florida touring plans, which provide step-by-step instructions for tackling Diagon Alley and the crowds at the Gringotts bank ride with maximum efficiency. Those guides are now available as premium touring plans that can be copied and edited in Lines, with versions for Early Entry guests and for those staying off-site. Today, we’re following up with the first installment of our most frequently requested touring plan: one-day/two-park plans covering both sides of the Wizarding World of Harry Potter. These new plans cover both Universal Studios Florida and Islands of Adventure. They feature all Harry Potter attractions (including rides on the Hogwarts Express in both directions) in a single day, and assume you have a Park-To-Park (Universal lingo for “parkhopper”) ticket. A few words of warning before you grab your robes and rush out the door. While operational capacity at Gringotts continues to improve a a daily basis, we expect the ride’s reliability to continue to consistently inconsistent for at least several more weeks. Especially during Early Entry, a lengthy breakdown while in line at the bank can derail the most carefully laid touring plan. Even if everything runs smoothly, this plan packs an exhausting amount of entertainment into a single operating day. It is NOT the ideal relaxing vacation experience. If you can afford it, we strongly suggest spending at least 2 or 3 days enjoying Universal’s offerings, rather than sprinting through them. While these plans are marked as for “adults” they are applicable for anyone who meets the minimum height requirements and is willing to experience thrill rides, which should include most older children and teens. If you are traveling with younger children, use the “child swap” rooms provided at all major rides, or eliminate and substitue for other nearby attractions. These plans are based on wait time data collected during the first couple weeks of Diagon Alley’s operations. We plan on continuing to test and adjust these plans through the summer, and will likely revise them at the end of the season once we can fully analyze the crowd patterns. Finally, these plans are designed to let you experience all of the Wizarding World, along with as many of the parks’ other top attractions. If your only concern is Gringotts and Diagon Alley, feel free to join the herd head there first thing and stay as long as you like; just understand it will come at the expense of experiencing other E-Tickets around the resort. Subscribers who wish do personalize these plans online should be aware that our software only permits one plan per park. Therefore, these plans are spilt into “Part 1” and “Part 2.” Begin by following Part 1 until you are instructed to travel to the other park, then switch to Part 2. When you reach the end of Part 2, return to the first park and pick up Part 1 where you left off. For visitors whose top touring priority is Harry Potter (or anyone who wants to experience Gringotts with less than a 2 hour wait), our #1 suggestion is to stay at an onsite hotel in order to secure early entry into the Wizarding World. This perk, which allows you inside select areas of the parks an hour before the general public, is worth its weight in goblin gold, especially since Universal Express passes (given free to guests of the 3 upscale onsite properties) aren’t valid for the Forbidden Journey or any new Diagon Alley attractions. It is also possible to book an offsite hotel package through Universal Vacations that includes early entry, but you’ll pay a premium for the privilege, and have to contend with getting to the resort early enough to make it worthwhile. Early Entry is available to all eligible guests every morning at both parks, with no restrictions (at this time) on which hotel guests can get into Diagon Alley on any given day. The only attractions operating during the Entry Entry hours are the Wizarding World rides (including the Hogwarts Express), plus Despicable Me at USF and Cat in the Hat at IoA. As a result, a substantial proportion of the guests in Universal’s 4000 hotel rooms descend upon Diagon Alley and Gringotts as soon as the gates open. Therefore, if you want to participate in Early Entry, you must be on a bus or boat as soon as the resort transportation begins operating, 2 hours prior to official park opening. Note that this plan is designed for guests without Express passes, such as those staying at Cabana Bay. It therefore requires a lot of “bouncing around” and criss-crossing the park in order to stay ahead of the building standby queues. Guests staying at the three luxury hotels with free Express access will be able to deviate freely from the touring plan after completing the early entry steps, and should encounter minimal waits at most attractions. Secure your park admission at least the day before your visit, either online or at your hotel’s ticket sales desk. Be waiting for the first bus or boat from your hotel, which should depart 120 minutes before the published public opening time. If you are staying at the Hard Rock Hotel it is quickest to walk via the path from the main pool. Arrive at the front gates of Universal Studios Florida at least 110 minutes before the published public opening time, or 50 minutes before early entry begins. Line up at the shortest available turnstile queue; ask a team member if you’re unsure which ones will be open. Once admitted to the park, proceed straight past Despicable Me, showing your hotel room key card to the employees stationed there. You will be held near the Shrek attraction, then walked through World Expo to the queue outside Fear Factor Live. Be cautious while walking; barricades near Simpsons and MEN IN BLACK serve as “pinch points” and can be hard to see through the moving crowd until you are pushed up against them. Enter London through the gateway outside Grimmauld Place, and approach the entrance to Diagon Alley, disguised as the Leicester Square subway station. 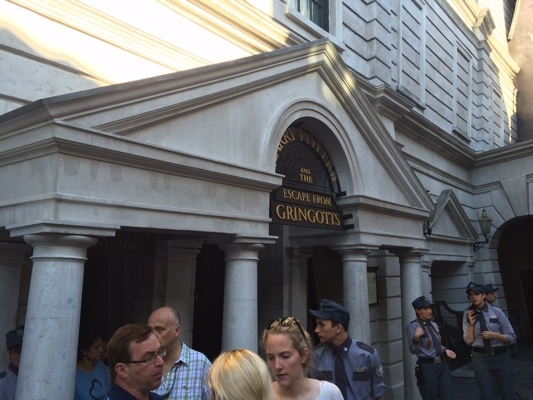 Once inside Diagon Alley, if Harry Potter and the Escape from Gringotts is operating, get in line for the ride. You may be diverted to the right through Carkitt Market to avoid congesting the main thoroughfare; otherwise, make a beeline for the bank below the fire-breathing dragon. By the time you exit Gringotts, Early Entry should be nearly over. Exit Diagon Alley towards King’s Cross Station, then cross through San Francisco towards the front of the park. Get to Hollywood Rip Ride Rockit just as the park is officially opening and be among the first to ride it. Exit Rockit towards the central lagoon and ride Transformers. Turn left out of Transformers to New York and ride Revenge of the Mummy. After exiting the Mummy, walk back towards Diagon Alley and continue past it to ride MEN IN BLACK. Head straight out of the MEN IN BLACK gift shop to The Simpsons Ride. Exit Springfield to the left and continue towards the front of the park to Despicable Me: Minion Mayhem. This will be a long wait, but it isn’t much better minutes after opening, and won’t drop significantly until closing time. If the time is around 2 hours after official park opening, walk down Hollywood and cut through the Gardens of Allah villas to experience The E.T. Adventure. You want to leave USF by three hours after the public opening time, so skip to the next step if you are running behind. Return to the London waterfront area and ride the Hogwarts Express train to Islands of Adventure. If using Lines, switch to Part 2 of this plan. Enter Hogsmeade and ride Dragon Challege. Eat lunch at the Three Broomsticks. After lunch, head left to ride Flight of the Hippogriff. 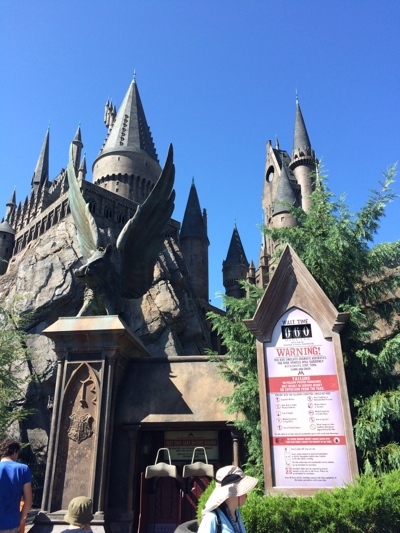 Following your flight, walk next door to Hogwarts Castle and brave the Forbidden Journey inside. If this is not your first ride on Forbidden Journey, use the single rider line. Alternatively, request a “castle tour” to experience the queue, then exit or ask to transfer to singles..
Cross the bridge out of Hogsmeade into Jurassic Park and ride the River Adventure, using the single rider line if open. Walk through Toon Lagoon to Marvel Super Hero Island and experience The Amazing Adventures of Spider-Man, using the single rider entrance if available. Exit Spider-Man to the right and ride The Incredible Hulk. Leave Marvel and walk through Seuss Island on your way back to the Hogsmeade train station. If it is before 4 p.m. and you are ahead of schedule, stop on the way and ride The Cat in the Hat. Ride the Hogwarts Express back to Universal Studios Florida, and switch back to Part 1 of this plan. If the “no re-ride” policy is being enforced, walk back to the other park. Walk to the Hollywood area a catch the next Horror Makeup Show, preferably the 5 p.m. performance or earlier. Return to Diagon Alley and explore the shops and sights, starting with Olivander’s Wand Shop, and wait for the show inside. The experience is virtually identical to the annex found in Hogsmeade, but there are three performance spaces so the line should moves at triple the pace; you should rarely wait more than 10 minutes for a show. After the show, purchase an interactive wand if you want to play with the magical effects hidden around the Wizarding World. At a shop in Carkitt Market you can exchange your Muggle money for Wizarding bank notes, which may be spent throughout the resort. The interactive animatronic goblin in the queue makes this literally the world’s most entertaining and elaborate cash grab; the wait here is usually around 15 minutes. Head down Horizont Alley to find the entry to Knockturn Alley. Explore the shop Borgin & Burkes, and the other dark corners concealed therein. Be sure to look at the map that came with your interactive wand under the blacklight in here to discover hidden messages. Browse the other shops in Diagon Alley, starting with Weasleys’ Wizarding Wheezes, Magical Menagerie, and Madam Malkin’s Robes for All Occasions. There may be queues for most of the stores, but you should be able to enter Wiseacre’s Wizarding Supplies at any time, since it serves as the exit to Gringotts. Be on the lookout for two live shows performing throughout the day. One is a musical appearance by magical jazz songstress Celestina Warbeck; the other is a reenactment of the “Three Brothers” fable from The Tales of Beedle the Bard (as seen in the seventh film), retold with Michael Curry-designed puppets. Showtimes are not posted, but the acts should alternate every half hour on the hour and half. Have dinner at the Leaky Cauldron. Eat an early meal to avoid crowds, but even at peak times the line moves swiftly. If you want ice cream for dessert, grab a scoop from Florean Fortescue’s. You may also want to try the elixir powders and gillywater sold in Carkitt Market, or the specialty beers and non-alcoholic cocktails at the Fountain of Fair Fortune and Hopping Pot. If you want another ride on Gringotts, get in the single rider queue before it closes for the night. This may happen as early as 2 or 3 hours before park closing, depending on how long the standby queue is. Once you’ve exhausted the entertainment in Diagon Alley, exit into London. Chat with the Knight Bus conductor and his shrunken heads on your way out of Diagon Alley. Also look for Kreacher in the window of 12 Grimmauld Place, and dial 62442 (MAGIC) in the red telephone booth. Revisit any attractions outside Diagon Alley that you skipped earlier or wish to repeat. Find a spot along the lagoon to watch the Cinematic Spectacular show five or ten minutes before the performances. Good vantage points can be found near London, Beetlejuice, Transformers, and in Central Park. Hogwarts and Gringotts in one day? It can be done with our new Wizarding World two-park touring plans. Diagon Alley will already be full of early entrants no matter what time offsite guests arrive. Early birds without Early Entry should therefore avoid the herd heading to queue outside London, and instead take advantage of lower waits in the rest of the park while saving Potter for the evening. Note that this plan is designed for guests without Express passes. It therefore requires a lot of “bouncing around” and criss-crossing the park in order to stay ahead of the building standby queues. Guests who purchase Express access will be able to deviate freely from the touring plan after completing the early entry steps, and should encounter minimal waits at most attractions. Secure your admission ticket before arriving at the resort, preferably online. If you purchased tickets though Universal’s website, you may use a credit card to retrieve your tickets from the automated will-call kiosks outside the entrance. Whatever you do, don’t waste time on the morning of your visit lining up at the ticket booths. Arrive at the front gates of Universal Studios Florida at least 30 to 45 minutes before the published public opening time. Leave at least 15 to 20 minutes to park your car and walk through CityWalk from the parking garage. Line up at the shortest available turnstile queue. Once admitted to the park, the majority of day guests will turn right down Hollywood Boulevard to await entry to Diagon Alley. Instead, proceed straight past Despicable Me and ride Hollywood Rip Ride Rockit as soon as the attraction opens. Step into the Gringotts queue before it closes for the night. This may happen as early as 2 or 3 hours before park closing, depending on how long the standby queue is. If this is your first trip through the bank, be sure to experience the entire standby queue; otherwise, use single riders if available. Come back soon when we’ll conclude this series with our new two-day/two-park comprehensive Universal Orlando Resort touring plans. Great info! We are staying at the Cabana Bay next september, for 5 nights with unlimited park to park, so we will try to use Early Admission one day for Diagon Alley and one day for Hogsmeade (haven’t been there yet and we are very excited!). I have to start designing a plan! This is awesome, I had made my own 2 park one day custom plan a while ago but without the input of this plan I never would have come to the realization that rushing to Diagon Alley at standard park opening was actually worse than waiting until late afternoon or early evening. I’m pretty disappointed though that with my trip being in September it doesn’t look like the low crowds are enough to compensate for the reduced park hours. I had to trim a lot of non HP activities out of the day to be done before the 8:30 closing, and even then to do Minion Mayhem and a couple other non HP rides it looks like I’ll need to pay a pile of money for Universal Express to get added to our tickets. Universal also makes me grumpy by advertising a “starting price” for tickets with Universal express that applies to about 8 days a year of “off peak” and doesn’t include September weekdays which are sold as standard. We also got our tickets from Virgin with xtra hours for Universal very good value. Big question do the Universal Parks have free wifi as this a big bonus especially if from UK with limited data packages. Also is the free wifi coverage all over the Disney Parks and easy to logon to? Hi Rob, I am from the UK too. The Disney wifi is very impressive. It’s fast and easy to login too. The upload speeds are awesome but it will kick you off for non activity but auto reconnects. Universal wifi is not as good yet. One option, if you have Three in the UK is that you can use you allowance over here in the USA for no extra charge. Unfortunately we are on Orange/EE but thanks anyway. So there is wifi in the Universal Parks too? Yes, there is now free wifi throughout the Universal Orlando resort. I find it works pretty well, good speeds and mostly solid connections even in queues. Thanks for the clarification. This will be a big bonus as I prefer not to use cell/mobile data when abroad due to the costs. However this is a big bonus in both Disney and Universal parks. We signed up to both touring plans. It appears that IOA opens at 7am for EE, while USF opens at 8. Is it faster/better to get into IOA at 7, and get in line for HE? When will the train start running? Would this possibly get us ahead of the crowd? If your priority is Gringotts, get to USF 1 hour before their early entry. HEx won’t be running when IOA’s EE starts and will put you behind the pack at USF. Staggered opening are only through mid Aug so it will soon be a moot point anyway. We are going in mid August, but we won’t try to take the train if it gets us behind the crowds. Thanks!